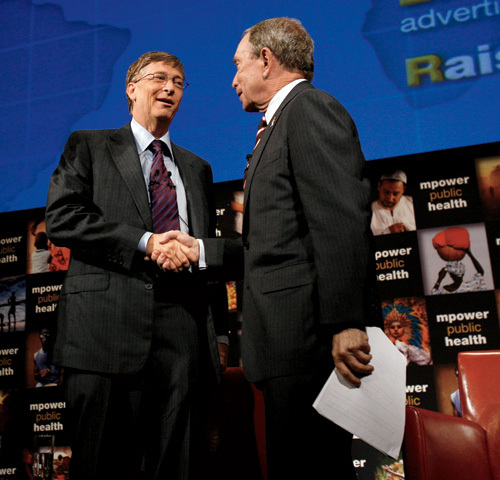 trusted tablets Michael Bloomberg versus Bill Gates No longer mayor of New York, and no longer seriously considering a run for president, Michael Bloomberg is now free to challenge Bill Gates for the title of world’s best philanthropist. This is exactly the sort of titanic competition that philanthrocapitalism needs – friendly, as the two men often partner to do good works, but nonetheless real. Expect him to focus on ending smoking, gun control and, especially, making the world’s cities the leading places where big problems get solved. order now New York versus London From charter schools to the High Line park, Mr Bloomberg partnered with philanthropy to help him improve New York. Bill de Blasio, his successor in City Hall, campaigned as the “anti-Bloomberg”, advocating traditional left-wing, big government solutions. All eyes will be on whether he actually intends to govern that way, and what that might mean for the well-being of New York. Meanwhile, now that Mr Bloomberg, a big fan of London, is footloose and fancy free, if Mayor Boris Johnson is really as canny as they say, he will ask him to give his metropolitan philanthropy a whirl there. https://mediaspectrum.net/healthcare/ buy now Impact investing’s big year Around the world, there are said to be 100 social impact bonds in the pipeline for 2014, which could make it a breakthrough year for impact investing. In September, the G8 taskforce on social impact investing led by Sir Ronald Cohen (of which Matthew is a member) is expected to propose some bold ideas to advance the field. Look out too for a joint initiative by some of the billionaire signatories of the Giving Pledge to use their money to build impact investing as an asset class. cheap generic viagra mail order pharmacy Etsy versus Warby Parker Will the artisan marketplace or the affordably cool, humanitarian specs maker be the first hot B Corp IPO? Will investors warm to shares in firms with the legal right to put their social mission before profit maximisation? We think Etsy will prove the answer is yes. viagra without prescription usa Is the B Team an A team? 2014 is the make or break year for Sir Richard Branson’s effort to forge a group of business leaders into a team of activists dedicated to making capitalism truly sustainable. A new chief executive will have to devise a credible strategy and execute it. Will herding corporate top cats be any easier than herding the regular feline variety? Here’s an idea for them: ethical sourcing from transparent supply chains strikes us as an issue whose time has come, after the deadly collapse in 2013 of clothing factories in Rana Plaza, Bangladesh. The B Team should embrace this cause. Unilever under fire? B Teamer Paul Polman has emerged as the leading example of a big company boss committed to putting his firm on a socially and environmentally sustainable growth path. But Unilever, the firm he runs, faces a tougher business climate in 2014, with slower growth likely in emerging markets and a reviving rival in Procter & Gamble. Will Mr Polman be able to resist pressure from shareholders to boost short-term profits at the expense of doing the right things for the long-term? All philanthrocapitalists should hope so. Malala 2.0 After a remarkable year in which she almost – and should have – won the Nobel peace prize, Malala Yousafzai must figure out what to do next. It is tempting simply to urge her to shun the limelight and return to school to finish the studies so violently interrupted when she was shot by the Taliban. But with such an already iconic global brand, she is certain to be showered with opportunities to use it for good. Choosing the right ones will not be easy. MDGs versus MDGs The world is in for a year of bipolarity as the 2015 Millennium Development Goals reach the home stretch. On the one hand, there will be much celebration of how much the MDGs achieved; on the other, much handwringing about how they fell short, and how the post-2015 goals should be far more ambitious. One thing’s for sure, unlike when the MDGs were devised in 2000, this time philanthrocapitalists from private business and foundations will have a seat at the goal-setting table alongside the politicians and multilateral bureaucrats. Africapitalism’s big chance Nigerian tycoon Tony Elumelu coined the phrase “Africapitalism” to describe the need for Africa to tackle its poverty problems by finding its own ways to grow its economies. In 2014, a lot of money from home and abroad will be exploring whether these new opportunities for profitable and inclusive growth are really there. Fingers crossed. Popular capitalism finds its voice We have long argued that for philanthrocapitalism to succeed the public must take more of an interest in how their savings are invested by the financial institutions to which they entrust their money. The #occupy movement popularised the notion that the word is being oppressed by an all-powerful 1%, but then ran out of steam. Expect more effective, targeted campaigning in 2014 such as by the carbon divestment movement on college campuses (Divest Harvard etc) and Britain’s Share Action. Philanthropists to watch Will this be the year when Laurene Powell Jobs makes her big philanthropic move? Maybe. Failing that, look out for Facebook cofounder Dustin Moskovitz and his wife Cari Tuna as they get into their philanthrocapitalistic stride. Also, with Jeff Bezos having bought the Washington Post and Pierre Omidyar launching his own media business, will a third tech tycoon make a move to disrupt and save the news industry? Michael Bloomberg (yes, him again) is rumoured to want to buy the New York Times and/or the Financial Times. But we suspect it may be worth keeping an eye on the media ambitions of LinkedIn founder Reid Hoffman. We wish you a happy and generous new year! Philanthrocapitalism is the practice of applying laissez-faire (bottom-line) economics to philanthropy/giving/donating. It hasn’t decreases extreme income inequality – the author argues it has increased it.